The 2015 GoldSim User Conference was held September 24th and 25th in Seattle and was a big success. Here are some photos showing the highlights of the conference, including the social events and poster presentations. 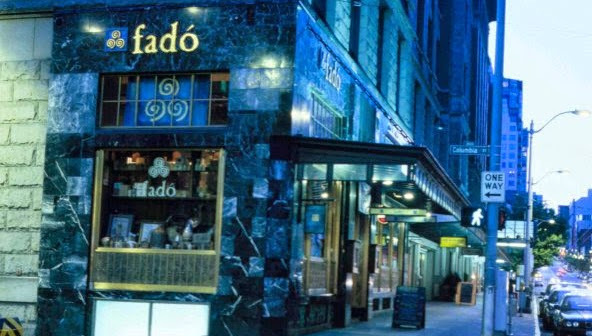 We started the conference with a nice welcome dinner at the Fadó Irish Pub in downtown Seattle. GoldSim rented the pub for the night so that attendees could mingle and enjoy the food and music. I really enjoyed getting to know more of our users and finally seeing many of the people I often talk to face to face. Rick (second from left) is singing along with the music for all to enjoy. Music accompaniment provided by an Irish musician. The conference was a great success, with almost 60 attendees from six countries. The first day of the conference consisted of a series of advanced training sessions. Rick is teaching a session on simulating active feedback control. The second day of the conference included invited speakers and a panel discussion. Guest presentation by Kate with Neptune and Co. The food served for lunch during the conference was excellent as was the company. Here are some photos taken during lunch at the conference venue (Washington Athletic Club). The day ended with a fun social event on a privately chartered boat ride in the Puget Sound. The weather turned out to be perfect, allowing everyone to spend a little time above deck to mingle and view the nice scenery of downtown Seattle. A key highlight of the conference was the poster session, which consisted of 17 presentations over a range of GoldSim applications, including water resource management, mining, forestry management, ecology, complex project simulation, evaluation of energy projects, and radioactive waste management. Winners of the poster session are highlighted in a previous blog post.